I love Kurma-be it the red variety or the white kurma. 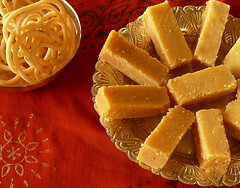 there are many variations of Kurma made in India, the southern variety especially the ones we make is coconut based. Infused with lots of coconut, spice paste, and meat or vegetable, this particular Chettinad specialty is called Vellai kurma because no turmeric or chilli powder is used which otherwise gives the kurma the color. Vellai kurma goes extremely well with Idiyappam, Roti or Parotta and can be had with rice too. This kurma tasted delicious with Thengai Paal Sadham and Raita~a delicious lunch served for a warm Sunday. 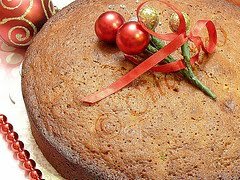 The list of ingredients is quite long but once I assemble all the ingredients and grind it with coconut then its relatively easy. This variety of kurma is little tricky with the spice level depending solely on green chillies, a little more or less will alter the spice level. Therefore when I made it this time I measured the amount of green chillies for my future reference as well. Heat 2 tablespoon oil in a pan or kadai and fry the ingredients to grind in the order given except the cashews and coriander powder. First add the fennel then the cinnamon,cloves and poppy seeds. To this add the onions and the chillies. Sauté till the onions turn soft. Now add the grated coconut and fry for about 2 minutes. When cool grind to fine paste with the cashews and coriander powder. Now heat the remaining oil and add the sliced onions and sauté til it turns soft. To this add the ginger garlic paste and give it a nice stir. to this add the chicken,tomatoes and salt. Sauté well until the chicken pieces turn white. To this add the yogurt and cook until the chicken is cooked. Now add the ground masala paste and water if required water and bring to a boil. Simmer for about 5 minutes. Heat the ghee in a kadai/pan and add the seasonings. When they pop add to the Kurma. Garnish with finely chopped cilantro. Serve with Idiyappam, Roti, Parotta or Rice. TIPS: The spice level of the kurma depends mainly on the amount and quality of chillies used. I used the Indian variety red chillies and Thai green chillies in this recipe. You could skip the red chillies and add green chillies instead. I have used chicken in this recipe. I have also used vegetables like Cauliflower, potato and peas instead of chicken in the above recipe. 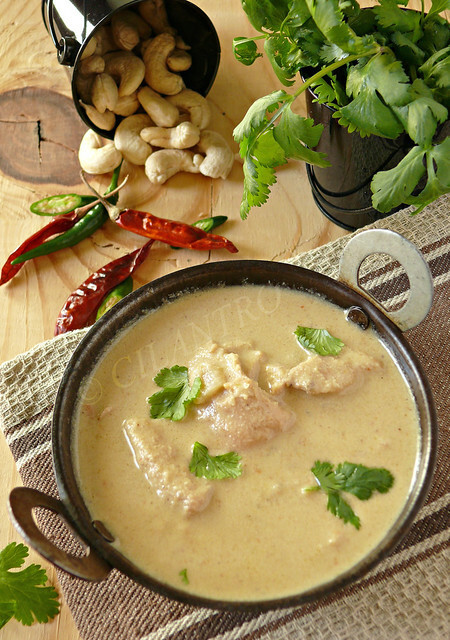 So rich and creamy kurma....Yummy.. Delicious and yummy kurma...popular in my in laws place.Love to have this kurma with idiyappam. Feel like grabbing that kadai and have this super flavourful kurma with some steaming rice, one of my fav. Delicious looking Korma!!!! I would love it whith hot steaming rice... yummm!!! Now this recipe excites me a lot! I'm gonna have to make it this coming weekend for sure.